The Apple MacBook Pro features Intel's new third-generation Core architecture for a boost in processor and memory speeds. New next-generation graphics deliver performance levels that are up to 60 percent faster than before. And high-speed Thunderbolt I/O lets you transfer data at rates up to 10 GBps. The MacBook Pro is a great computer that just got even greater. macbook pro 13 front The 13.3-inch MacBook Pro (view larger). As with previous models, the MacBook Pro features a precision unibody enclosure crafted from a single block of aluminum, creating a thin and light mobile computing workhorse (less than 1 inch thin and just 4.5 pounds) that's also highly durable. It includes a 13.3-inch, LED-backlit glass display as well as a glass trackpad that doesn't include a button (for larger tracking area) that features Apple's Multi-Touch technology. You'll also get up to 7 hours of battery life while on the go. The MacBook Pro also now includes both a high-speed Thunderbolt port and two USB 3 ports, enabling you to easily connect to external displays and a wide variety of high performance peripherals. This version of the 13.3-inch MacBook Pro (model MD101LL/A) features a 2.5 GHz Core i5 dual-core processor, 500 GB hard drive, and 4 GB of installed RAM. Other features include an 8x SuperDrive, ultra-fast Wireless-N Wi-Fi networking, Bluetooth 4.0 connectivity, an SDXC card slot, and a FireWire 800 port (see full specifications below). 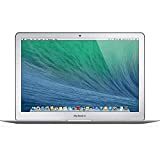 Refurbished 13.3-inch MacBook Air 1.3GHz dual-core Intel Core i5 Up to 3x faster Wi-Fi - MacBook Air now supports ultrafast 802.11ac Wi-Fi. When connected to an 802.11ac base station, wireless performance is up to 3x faster than with the previous generation of MacBook Air.2 And your Wi-Fi range improves as well. With Bluetooth technology, you can connect MacBook Air to Bluetooth-enabled devices like speakers and headphones. Even without all the wires, you're totally connected. Thunderbolt and USB 3 - With the lightning-fast Thunderbolt port, you can connect your MacBook Air to the latest devices and displays, like the Apple Thunderbolt Display. But that's not the whole story. MacBook Air also comes equipped with two USB 3 ports, so you can connect the latest USB 3 devices and access a pipeline that's up to 10 times faster than USB 2. With just a few connections, MacBook Air transforms from an ultraportable notebook to a complete workstation. This is an Apple MacBook Air 11" MD711LL/B Laptop computer, featuring Intel i5-4260U 1.40GHz processor, Webcam, 4GB RAM, and a 128GB SSD. This machine is fully refurbished and will offer you years of computing, backed by our 90-Day Warranty!